I am interested in the organisation of ant societies, specifically how the simple behavioural rules followed by individual ants interact to produce adaptive colony-level behaviours. 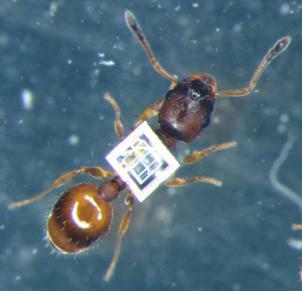 My research in the Ant Lab, Bristol, used Radio-frequency Identification (RFID) technology to investigate the allocation of the work-force to different tasks within the colony, and how this is affected by the responses of individuals to changes in task need. I also used RFID to study how simple individual decision rules can combine to produce unanimous collective decisions. For this work I am studying the British ant Temnothorax albipennis. Previously I have focussed on the organisation of foraging by the use of trail pheromones in the highly successful scavenging Pharaoh's ant Monomorium pharaonis, and the organisation of waste-disposal by the tropical ant Pheidole ambigua. Currently, I am based at the University of York, where I have a Royal Society Dorothy Hodgkin fellowship. I am studying the organisation of nest networks in polydomous species of ant, and how network structure relates to adaptive function. More information. The robustness of ant societies is one of the key factors in their success and makes them a fascinating paradigm of self-organisation. In our modern world, overloaded with information, the necessity of decentralised control is becoming ever more pressing. Understanding more about how ants organise their societies in a flexible dynamic way could lead to new insights into many of our systems. Robinson, EJH, Smith, FD, Sullivan, KME & Franks, NR. (2009) Do ants make direct comparisons? Proceedings of the Royal Society Series B, 276, 2635 - 2641. Robinson, EJH, Richardson, TO, Sendova-Franks, AB, Feinerman, O & Franks, NR. (2009) Radio-tagging reveals the roles of corpulence, experience and social information in ant decision making. Behavioral Ecology and Sociobiology, 63, 627 - 636. Robinson, EJH. (2009) Physiology as a caste-defining feature. Insectes Sociaux, 59, 1 - 6. Robinson, EJH, Holcombe, M & Ratnieks, FLW. (2008) The organisation of soil disposal by ants. Animal Behaviour, 75, 1389 - 1399. Tofilski, A, Couvillon, MJ, Evison, SF, Helantera, H, Robinson, EJH & Ratnieks, FLW. (2008) Pre-emptive defensive self-sacrifice by ant workers. American Naturalist, 172, 239 - 243. Franks, NR, Hardcastle, KA, Collins, S, Smith, FD, Sullivan, KME, Robinson, EJH & Sendova-Franks, AB. (2008) Can ant colonies choose a far-and-away better nest over an in-the-way poor one. Animal Behaviour, 76, 323 - 334. Robinson, EJH, Green, KE, Jenner, EA, Holcombe, M & Ratnieks, FLW. (2008) Decay rates of attractive and repellent pheromones in an ant foraging trail network. Insectes Sociaux, 55, 246 - 251. Robinson, EJH, Tofilski, A & Ratnieks, FLW. (2008) The use of native and non-native tree species for foraging and nesting habitat by the wood-ant Formica lugubris (Hymenoptera: Formicidae). Myrmecological News, 11, 1 - 7. Robinson, EJH, Holcombe, M & Ratnieks, FLW. (2008) An agent-based model to investigate the roles of attractive and repellent pheromones in ant decision making during foraging. Journal of Theoretical Biology, 255, 250 - 258. Couvillon, MJ, Robinson, EJH, Atkinson, B, Child, L, Dent, KR & Ratnieks, FLW. (2008) Onslaught of conspecific intruders triggers rapid shifts in guarding behaviour in honey bees (Apis mellifera). Animal Behaviour, 76, 1653 - 1658. Robinson, EJH, Jackson, DE, Holcombe, M, & Ratnieks, FLW. (2005) Insect communication - 'No entry' signal in ant foraging. Nature, 438, 442 - 442. Cordell, SC, Robinson, EJH & Lowe, J. (2003) Crystal structure of the SOS cell division inhibitor SulA and in complex with FtsZ. PNAS, 100, 7889 - 7894.